attempt the Vigilante mission. 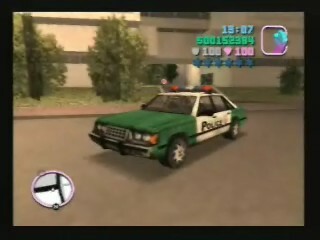 Here, you are required to chase the other criminals of Vice City, and kill them. The criminals you have to kill will appear as yellow blips on the map. In your vigilante vehicle, make your way to their location, and kill them. Depending on which type of vehicle you are using will determine how quickly and easily you can take out a criminal. Each group of criminals count as one level. For each level you complete, before the time limit, the next level will have a higher number of criminals to kill. All the criminals will be in cars. As you move through the mission, the amount of cars used will increase, and make it more difficult to catch, ad they can split up and go of in different directions. It won’t be as easy as it sounds, however. The real police do not take to kindly to vigilantes, and will be on your tail quickly and harshly. They will make the mission a lot harder for you to complete. If you can, try and do this mission in a heavy vehicle (something bigger than a standard police car), a tank or the apache helicopter. Once you've completed level 12 of this mission, you will be rewarded with an additional 50 points added to your Armour total. So your maximum armour will now be 150.